These capes are one of the girls’ favorite things that we have yet made. I am not kidding when I say that this cape comes out everyday….and I won’t let it be worn to school yet (it’s still in the mid 80’s here—and apparently I am a mean mom) so someone is waiting for the day that it will finally be cool enough that she can wear it to school. But I am glad that it is a keeper, because it was easy and cute. 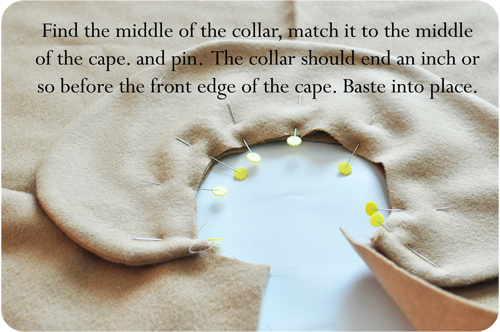 Here is the thing about this cape…..and I know I say this often on our blog but you are all going to faint at how easy this pattern is. All it is…..is a BASIC CIRCLE SKIRT! No. Really. It. Is. A. Circle. Skirt. One word of advice: This was a thrifting challenge, so I ended up making the linings of these capes from regular cotton fabric. In real life, I WOULD NOT. 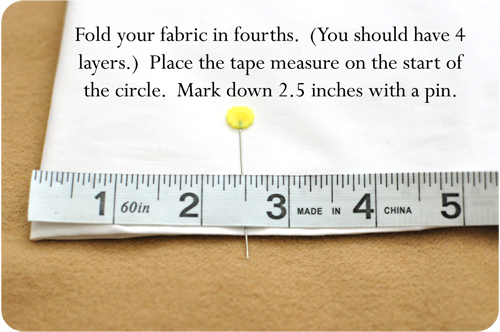 Take the time to get real lining fabric….it will look much more like a professional coat, and you will be much happier with it. Also, I made two capes. 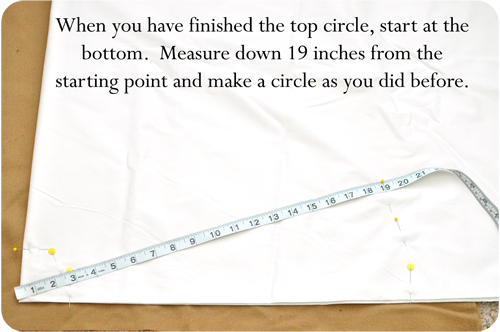 I will give you the measurements for the Big Girl cape in the tutorial….and will give the Little Girl cape at the bottom. (It was too confusing to put them both in…) If you are looking for sizing, the Big Girl cape was put on a six year old but I am guessing would fit anyone up to about a size 8 or a small 10. The Little Girl cape could go anywhere from about a size 2 to a size 4 or 5. *You should work on the folded edges….and not the seldvege. 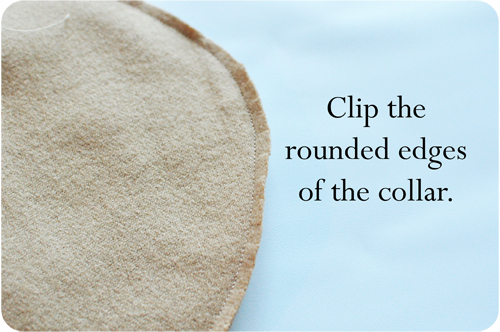 *One thing I forgot to tell you….you need to make to slit on one of the folds to make the circle open. Thanks everyone! And we would LOVE to see your capes! You can add them to the flickr pages….to the right of our blog! That is way too cute! I love that they desperately want to wear them to school. You know you’ve made a winner! I am so in love with that picture. It is so classy. I think I could actually make that cape too! These are so adorable and I am so grateful for the inspiration and the pattern instructions. Could I please be a total chancer and ask how you did the arm openings as in the last photo? Very neat! I love simple patterns like that! They aren’t real arm holes….they are fake 🙂 I just cut 2 rectangles, put them right-sides-together, sewed them together leaving an opening to turn. 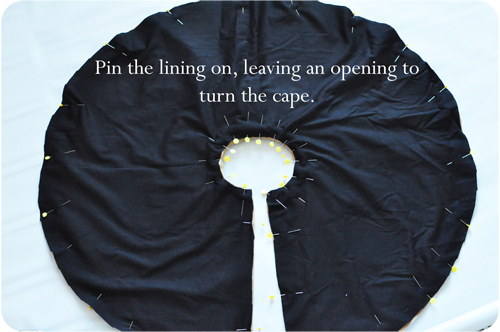 I then flipped each rectangle right side out and topstitched it onto the cape. Simple,(and totally fake) but I liked the look. Hope that helps! Thanks for your nice comments everyone! I really want to make these! I found you via sew fantastic.blogspot and now I’m a follower! My blog is http://www.jamesandleighann.blogspot.com I love to craft and sew! What a fantastic idea – these capes are gorgeous! What fabric did you use? Is it felt? I can’t wait to make one for my daughter! unfortunately I can’t talk my daughter into being this for halloween…maybe next year? These are adorable! I popped over from Tater Tots and Jello’s Facebook posting! 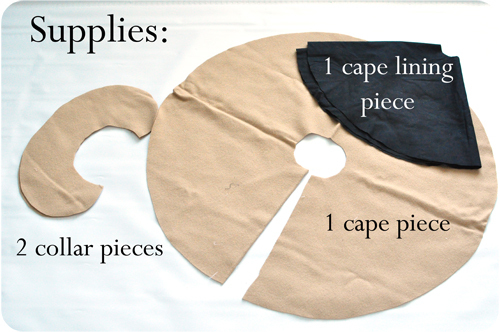 What kind of fabric did you use for the cape and how much did you need? Thanks! What is the yardage I would need for the little girl cape and the big girl cape? I am a new sewer and I can’t figure out how much fabric to start with before I sew, I would like to make these ASAP thanks! Hi! This is so classy!!! Found this through SewCanShe and I would love to make one. What fabric did you use for the outside and approx. how much for each one? Hi! Beautiful cape! My daughter, Audrey, would love it! 🙂 I am also wondering what material you used and how much yardage for the Little Girl cape? I used wool for these two capes that was vintage. I used about 1 yard of 60 inch wool (they don’t make it that wide any more) for each cape. I did have leftovers but that would give you a starting point! I would like to add your blog to my Pinterest board, as a blog worth reading, hope that is okay with you, you have amazing ideas that I would love to have my daughters see and make some for my grand daughters!! This is so amazingly adorable. 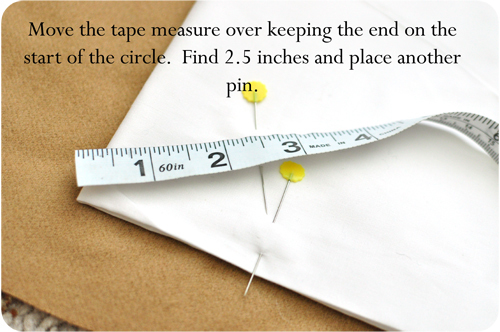 I just clicked on this link from See Kate Sew and loved this post. Although summer is coming up, I’ll keep this is mind for winter. Would you suggest to hang the circle after it is cut to let it hang (since it is on the bias) for 24 hours and then recut it? this is adorable, my girls need one and so do I! Thanks for sharing this with all of us! Terrific!! I will try it for my 6 years old girl. Thank you very much!! 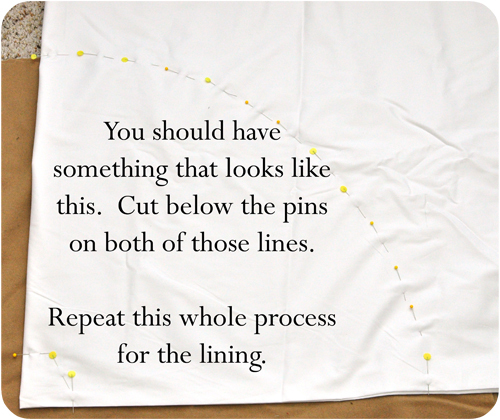 Looks so easy to sew!! And they look lovely cool. I’ll try for my little one (and maybe a big one for me too!!). HELP PLEASE! What kind of wool? I’ve never sewed with it before, and don’t wear it myself. I just searched “wool” on the joann.com site and the above was included in the results. Is there a better place to get wool? I love, love, love, these capes and cannot *wait* to make them! Thank you for such a great tutorial! I LOVE this! I mean really LOVE IT! So I made my own grown-up version of it – why should little girls have all the fun! So I made a houndstooth “big girl” version of this great and easy project. 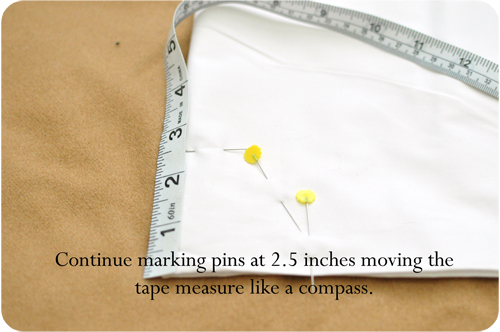 It was totally doable for even a novice “sewist” like me. Just changed the collar using a pattern I had from another project, fused stabilizer in it to make it stand (although it’s a little bigger than I wanted) and made my own cover button with a button kit I had lying around. Used about 2 yds (60 in wide) of worsted wool from Fabric.com ($9.98/yd) and polyester lining material that I had to piece together by quarters since it was only 45 in. wide, cost around $2/yd and used about 3 yds. May try it again in camel if I can find reasonably priced wool…….yes ladies and gentlemen, if I can do it, so can you! oh my god!! it’s so beautiful!! I’m going to buy felt right know!! thank you so much!!! Thanks so much for this. My little pink pink princess was going to freeze while trick or treating. Thanks to your tutorial, and some spare minky I had, she’ll have a pretty little cape. No big puffy coat over this girl’s costume! 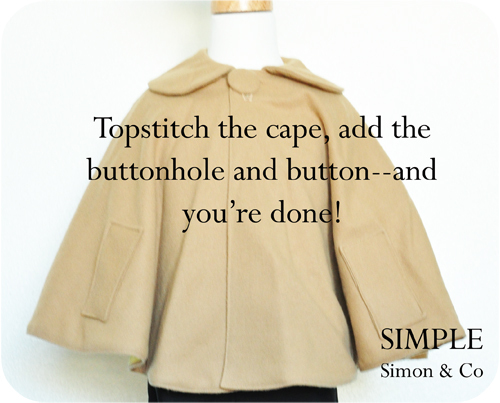 Thanks for this – it was so incredibly easy and looked great – I did a reversible cape for my niece with ties instead of a collar and button. She loved it! Oh my goodness. Thank you, thank you for such a ridiculously simple tutorial! It only took me 90 mins from start to finish. Not bad for a complete sewing novice. I am so excited to make this for my little niece, who is the first little girl in our family (I have two boys), and her mom’s favorite movie is Breakfast at Tiffany’s! Thank you!!! 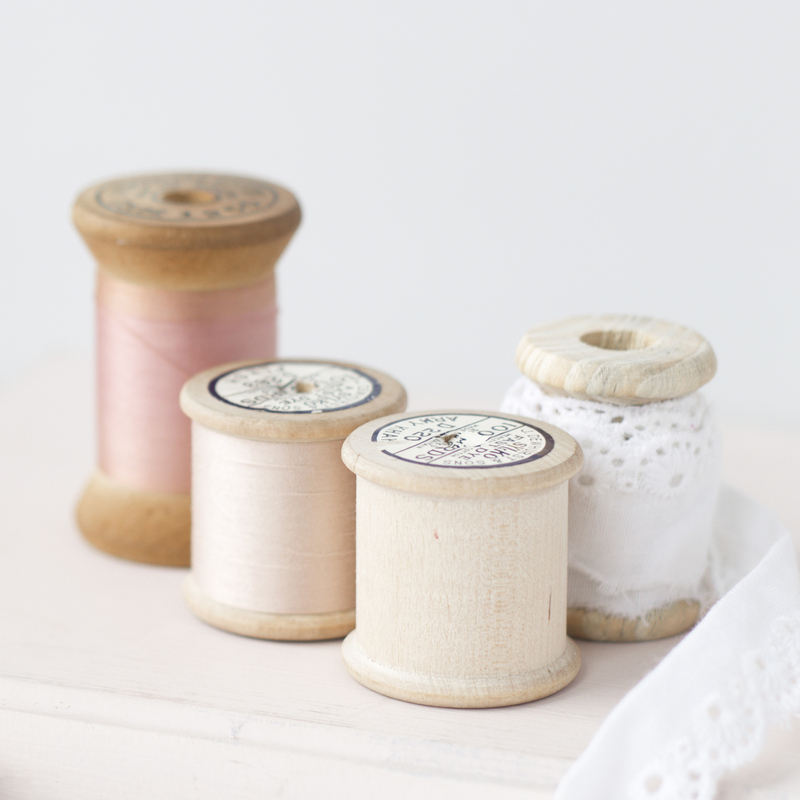 Thank you again for your wonderful blog and inspiring sewing! I just completed a little cape for my daughter, I made it a bit smaller as she is only 15 months old. I am entering it in into local sewing competition in my home town in Australia. It was so easy to make and came up really well. I bought an old full length coat from an Op Shop and cut it up. It cost me a dollar to get and is 80% wool. I only used one side of the coat so my best friends little one will be getting one too from the other side for her birhtday. I love seeing them dressed the same. Your capes were my inspiration! I purchased an ivory dress coat from a Thrift Store, but discovered moth holes. I took it apart and used the fabric to make capes for my two and three year old granddaughters. I lined them with a leopard print blanket fabric. I used feathers and strung pearls for their birdcage hats. I turned out to be the best $10 I spent in quiet a while. Thank you for the inspiration! Oh my gosh, I can’t believe I made this! With two boys I never thought I’d get to sew something so girly- but my kids have been watching project runway, and when my nine year old wanted to sew something for a girl in his class, I knew we had to try this! 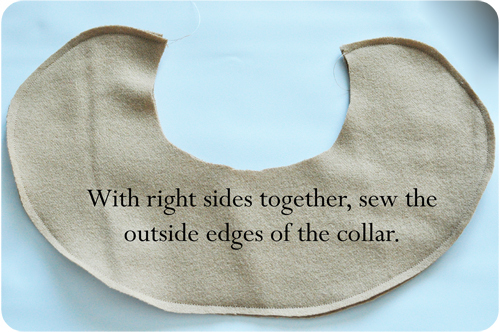 I’d never sewn a lining OR a collar before, but the instructions made it easy. I used a stiff camel-coloured fabric that was almost like thin canvas- it really looks great!! Now I need to figure out how to a) sew a buttonhole, and b) figure out how to make this for ME!☺ THANK YOU! Will the cape fit for a 11 year old? I LOVE this. 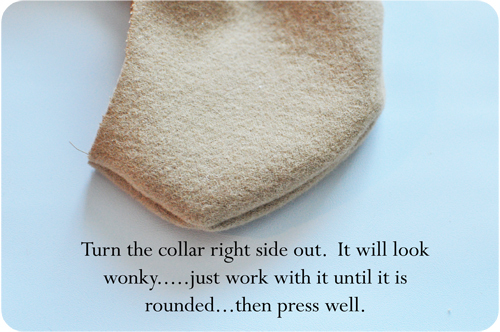 What kind of collar is that, did you draft it yourself. Curious to know what size neckline as well. How did you make the hat?